I want to share my impressions from a recent visit to St. Petersburg where I was invited to speak on a panel titled “Never Let a Good Crisis Go to Waste.” The title is another version of the old Chinese proverb, “A crisis also presents new opportunities.” This is what is emerging today in the Russian Federation and radiating outwards across the broad expanse of Eurasia and into all Asia, Africa, the Middle East and Latin America. Today it is clear that the New World Order of Bush was intended to take unscrupulous advantage of the disorder following the end of the Soviet Union to forge a unipolar world where one tiny group would dictate to the entire world its terms of existence. Pursuit of that has been the sole aim of the US foreign policy and their wars, fear campaigns, under three US presidents over the past quarter century since the end of the Soviet Union. It motivates the US-instigated civil war in Ukraine, in Syria, against China in the East China Sea, US covert backing for ISIS. It drives the US economic sanctions against Russia, sanctions which Washington has arm-twisted the EU into supporting, much to the detriment of the EU and their economies. What I witnessed not only in St. Petersburg but also in other recent visits to Russia is something I can only call extraordinary. 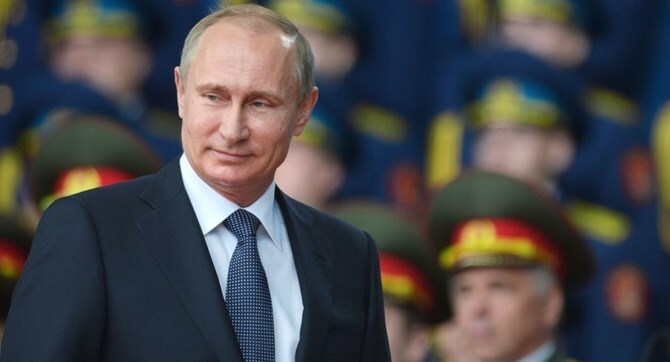 Rather that cower in terror at the endless barrage of attacks and economic and financial sanctions thrown at her, Russia and her leadership are becoming more confident and, crucially, more self-reliant and aggressive in a positive way as never before. Some examples will illustrate. Today’s Russian leaders have realized that what was considered under the corrupt Yeltsin era to be a liability—Russia’s agriculture—is one of her greatest assets. I had occasion in the context of this year’s St. Petersburg International Economic Forum, to speak with the Deputy Secretary of Agriculture who told me the government has made a strategic decision to use the sanctions and Russian “counter sanctions,” namely banning imports of major food products of the European Union, to build a Russian natural or organic food production. They have realized that the abundantly rich, fertile Russian soil, owing to the Cold War requirements of diverting most chemical production into the military defense sector, has largely avoided the heavy soil application of agrochemicals that have done severe damage to the farmlands of the United States and much of the European Union since 1945. American agribusiness methods have been marvelous for increasing harvest yields but not for maintaining nutritional quality of the food produced. Here is where Russia has realized it can become a major world producer of organic, non-GMO quality agriculture products. Fertile Russian agriculture lands become even more strategic to world food supplies as the similarly fertile black soils of Ukraine are being destroyed by war and chaos there. What was also abundantly clear during my St. Petersburg talks and observations is the tremendous Russian dynamic of creating change in the existing world order. Sanctions are forcing Russia to do very good things. Ridiculously ineffective Washington efforts to try to block western capital for Russian companies, especially energy companies, and the dramatic escalation of NATO provocations around Russia have forced a decision to strategic self-reliance or to cooperation with non-NATO trade partners. The diversity of such strategic trade deals that emerged from St. Petersburg is impressive. Andrew Korybko, journalist and analyst with Moscow’s Sputnik News detailed some of the most significant of the deals that emerged from the Russian forum. Korybko points out that far from being regarded internationally as a pariah state, as a “rule-breaker” of rules of the Washington game, today’s Russia is becoming a magnet of international interest unprecedented her history. That was demonstrated in the attendance at the annual St. Petersburg forum. Despite strong efforts by the silly US State Department to discourage attendance in St. Petersburg, this year a record number of paid participants, some 10,000, joined in three days of intensive discussion and signed over 200 contracts worth $5.4 billion in new trade deals with Russia, with tens of billions in new deals in serious negotiation. Attendance was some 25% more than a year ago, and a record for the 19 year-old forum, despite the repeated Washington and Brussels efforts to demonize Russia and Putin. Sending a clear signal to their NATO-tied governments that they do not regard Russian sanctions as a hindrance to further cooperation with Russia in development of Russia’s vast undeveloped hydrocarbon resources, Britain’s BP and the Anglo-Dutch Royal Dutch Shell, as well as Germany’s E.ON, made major new agreements with Russia in St. Petersburg. Russian energy giant Gazprom and Shell signed a memorandum on the construction of a third technical line for a liquefied natural gas plant on Sakhalin Island on Russia’s Pacific Coast. Gazprom also signed a memorandum on the construction of a gas pipeline from Russia to Germany through the Baltic Sea with E.ON, Shell and Vienna-based OMV oil and gas company. The Baltic deal calls for construction of a new gas pipeline to Germany alongside the current Nord Stream line. The new project will have a total capacity of 55 billion cubic meters annually, twice as much as the current Nord Stream volume. After foolish Brussels attempts to sabotage further Gazprom-EU gas deliveries, it has dawned on EU governments that as chaos in Ukraine spins out of control, a major share of the EU gas pipeline supplies from Russia threatens to go down with it. As a consequence of EU pressures on Bulgaria and other EU states, last December, during talks with Turkish President Erdogan in Ankara, Russian President Vladimir Putin announced, to the shock of Brussels, that South Stream, a $45 billion project to deliver Russian natural gas via underwater pipeline through the Black Sea to Bulgaria and on to other Balkan and southern European markets, was dead. 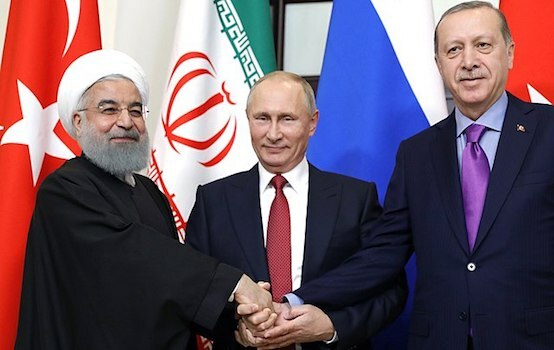 Instead, Putin announced talks with Erdogan to create what is now called Turkish Stream, a pipeline that will bring Russian gas through Turkey directly to the borders of Greece. What route it takes to which EU countries from that border will depend on EU decisions. That was by no means all in terms of energy deals reached in St. Petersburg. Gazprom and French gas company ENGIE discussed the need for new routes of direct gas supplies to Europe. And Russian oil giant Rosneft signed a deal with the British oil and gas company BP who bought a 20 percent stake in Taas-Yuryakh Neftegazodobycha in Eastern Siberia, creating a new British-Russian energy joint venture. For those in the West claiming, as the neo-conservatives at the US State Department and in the Obama White House or office of Defense Secretary “Ash” Carter do, namely that Putin is stealthily laying the basis for rebuilding the Soviet Union, were there any basis to it which is not at all clear, the more Russia’s economy depends on mutual cooperation and respect for EU countries, the more absurd such charges become. As if the scale and diversity of those new deals were not sufficient, agreements of Putin’s Russia with highest-level representatives of Saudi Arabia and of India underscored the avant garde role Russia is playing increasingly in creation of a multi-polar New World Ordering. One of the most geopolitically fascinating developments around the St. Petersburg forum was the appearance of Saudi Prince Mohammed bin Salman, Defense Minister and son of King Salman. Prince bin Salman, and Putin held a joint press conference during the St. Petersburg International Economic Forum where Putin announced he had invited Saudi Arabia’s King Salman to visit Russia, and had accepted an invitation to visit Saudi Arabia. In addition, the two discussed Saudi purchase of Russian nuclear power technology. Saudi Foreign Minister Adel al-Jubeir told RT that Saudi Arabia plans to use Russia’s expertise to build up to 16 power-generating nuclear reactors. Russia and Saudi Arabia signed an intergovernmental agreement on cooperation in the peaceful use of nuclear energy. According to Russia’s state-run atomic energy agency Rosatom, for the first time in the history of Russian-Saudi relations it creates a legal framework for bilateral cooperation in nuclear energy, and opens prospects for cooperation in construction and operation of reactors, nuclear fuel cycle services as well as education and training. We can imagine this statement raised more than a few eyebrows in Washington and London and Brussels NATO headquarters, where it’s been assumed ever since the 1945 meeting between US President Roosevelt and Saudi King Ibn Saud securing exclusive rights for American oil majors to develop the huge oil reserves of the Saudi Kingdom, that Riyadh would be a US vassal state. Other deals in the context of the recent St. Petersburg international economic forum are too numerous to detail. They included India, Myanmar and numerous other countries. In brief, St. Petersburg demonstrated for the world the utter bankruptcy of current US policy to try to isolate and demonize Vladimir Putin’s Russia. 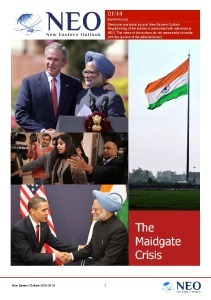 By pursuing a strategy of making peaceful economic and trade deals with her allies in the Shanghai Cooperation Organization, above all with China; deals within the BRICS states with India, Brazil, South Africa and China and within the Eurasian Economic Union, Russia is emerging as the avant garde of a New World Ordering, one where respect for national borders and national sovereignty again becomes the cornerstone. To borrow from the text of the great American country singer and songwriter, Carl Perkins, Russia is saying to Washington, “You can knock me down, step in my face, Slander my name all over the place. And do anything that you want to do, But uh uh, honey, lay off of my sovereign right to exist and prosper in peace with my neighbors.” Bush’s New World Order is crumbling before our eyes as Russia gives birth to this New World Ordering. It’s fascinating and quite beautiful to watch.